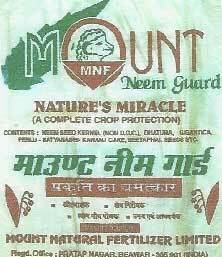 We are instrumental in offering Mount Neem Guard that protects the crops from different types of diseases and increases the resistance power of standing crops to tight with different agricultural insects. It contains Mount Neem Seed, Dhatura, Gigantica, Peelu, Satya-Nashi, Karanj Cake, Seetaphal Seeds, etc. They are grinded to 100 mesh powder. We offer Mount Neem Guard in different quantity packaging and at most affordable price.